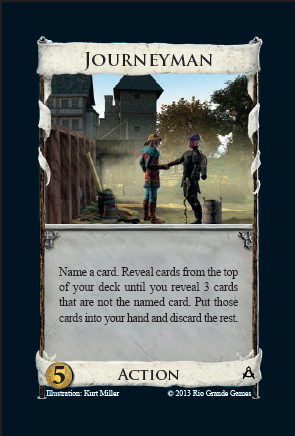 This is the third of several previews by Donald X. Vaccarino, introducing the next Dominion expansion: Guilds. The community is discussing these new cards in the Guilds Preview subforum. On the metaphorical road from being an apprentice to being a master, there comes a point when you must hit the physical roads and travel around the land, practicing your craft. Your travels could you take you all over Europe, from some famous place in Spain, to Wawel Castle on the Vistula, built during Casimir III’s reign. There you might see the sword Szczerbiec, which is all that remains of the Polish crown jewels today. The hilt is decorated with flowers, symbols, and magical formulas, and the blade has a notch in it, a gap, which currently holds a small shield with the coat of arms of Poland. You wouldn’t be working on anything so fancy yourself though; you would only be a Journeyman. Which is today’s card, hooray, I got there. At one point the 13-card Guilds somehow squeezed in a minor third theme, which was “name a card.” I didn’t end up including much of it, but Doctor and Journeyman give you a taste of it. Name a card; draw three cards that aren’t it. During playtesting we sometimes called this one Bigot Parade. “We hate Estates!” they chant, marching past the Jagiellonian University, which Casimir III established. Early in the game, Copper and Estate are the popular options. Later on you might name another VP card, or Curse, or maybe a Village you’ve got that you feel like you’ll be so unlucky as to draw now with no actions left. Too many Journeymen? Just name Journeyman. does the “those cards” in the text refer to the three cards that are not the named card, or all the cards you drew, including the named card? I think the first. Consider naming Copper with nothing else in deck: would result in drawing all the coppers (and the 3 Estates).